Today Dunkirk started to feel settled again, it felt like people were building up their community, supporting each other and involving our volunteers in their daily lives. Despite their situation they all wanted to say hello, play and even join in with our work. 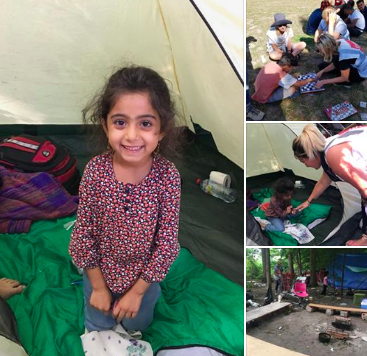 I was lucky enough to have a little Iraqi girl help me for most of the afternoon, picking up bits of old tents that had been destroyed two days before in the raid by the CRS. She was eager and despite neither of us knowing each other’s language (she picked up English very quickly) we soon were calling each other ‘my friend’. Shortly after this another volunteer and myself was invited for a cup of tea in her family’s clearing, despite not owning much, they pulled out a cushion for me to sit on while they sat on the floor. The family told me about their lives before the troubles and their professions. They were friendly and full of hope that one day they would be able to provide a safe life for both of their young daughters. I cannot express how kind and generous they were, along with the rest of the refugees at Dunkirk. Meeting them today provides even more evidence that something needs to change in our system so everyone has the opportunity to provide their children with a brighter future.